by Rolf F. (Image rights). The Yashica T3 (also known as the Kyocera T Scope) was a 35mm compact camera from Kyocera with a high quality lens and viewing window (waist-level finder) on the top of the body. The T3D variant has a date back. The T3 model was preceded by the T2 and succeeded by the T4. 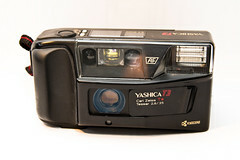 The Yashica T series are street-famous for the quality of image given by their Zeiss T* lens, featuring excellent sharpness, contrast, and almost complete lack of optical artifacts. Carl Zeiss Tessar T* 35mm f/2.8 lens, 4 elements in 4 groups. Fastest lens in the T series. Programmed electronic shutter (1/630 - 1 sec) with electromagnetic release. Programmed electronic autoexposure system with SPD sensor. EV3-17 coupling range at ISO 100. Automatic ISO setting with DX film (ISO 64 - 1600). Speed is set to ISO 100 for non-DX film. 16-zone autofocus from 0.5m to infinity, with focus lock feature on trigger half-press. No infinity lock. Albada type bright viewfinder. Displays frame markings, including parallax correction marks. Uses a steady green LED to indicate when subject is in sharp focus and blinks when subject is not in focus. Red LED is used to indicate that flash is charging and to indicate that flash will fire during trigger half-press. Digital display on top of camera features lens barrier open mark, exposure counter (up to 39 frames), autofocus mark, battery level indicator, self-timer mark, flash status and mode, long exposure warning. Film autoloading, automatic film advance and automatic rewind. Mid-roll rewind possible via manual button. Self-timer with 10 seconds delay. Indicated by self-timer lamp. Can be cancelled. Built-in flash with 0.6s recharge time at normal temperature. Features multiple modes: automatic fire in low light, forced fire, forced suppression. Flash range is 0.5-3m at ISO 100. 6v lithium battery (2CR5) provides power for approximatively 1500 frames when 50% of them are taken with flash. Lens has a glass barrier and protection slider, that also acts as switch for low-power mode. Water resistant (JIS Class 4 - splashproof), with O-ring protecting the film door. Right-angle viewing scope at the top with 67% field of view. T3D model only: date back with built-in quartz clock and liquid crystal display. Date unit uses a 3V lithium battery (CR-2025). Camera dimensions: T3 128(W)x67.5(H)x52(D)mm, T3D 128(W)x67.5(H)x54.5(D)mm. Camera weight empty: T3 275g, T3D 295g. Camera weight loaded with film and battery: T3D 390g (measured). Yashica T3 review at 35mmc.com. Yashica T3D repair manual at Mega.co.nz. Yashica T3 at the Sylvain Halgand Collection.